The first time I was in Dearborn, MI I was drinking from a bottle, warmed on the hood of the family station wagon. My mother remembers that on the way to Greenfield Village, my folks would warm my bottles with the heat generated by the engine. The car wasn’t moving, of course, but the engine was on, and did the trick. Needing to eat “on the move”, my parents made it work! Today, Greenfield Village & Museum offers much more than just car history, including a “Food and Farm” focus, with daily culinary demonstrations and a Historic Recipe Food Bank. The focus is on the car industry, and Henry Ford, in the area surrounding Dearborn, MI. I thought I’d try something different, and see a little of the area by bike on this trip. 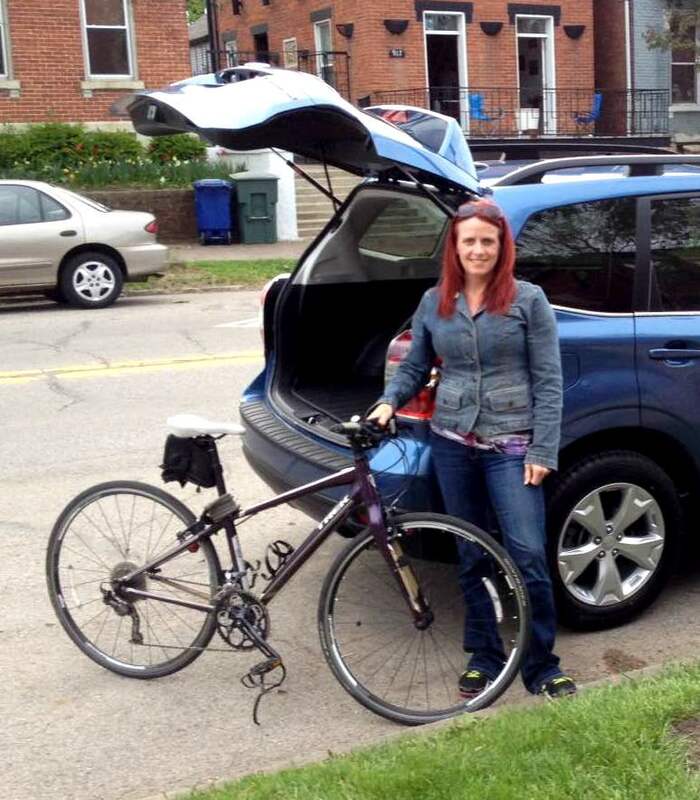 When I bought my SUV (a Subaru – my 1st) I brought my bike with me, to make sure it fit in the car, without having to take the front wheel off. One of the back seats is down more often than up, to accommodate the purple Trek hybrid. I drive to many of my work destinations, so both my bike & my car have seen much of the 9 Midwestern states in my official territory. This trip, I stumbled upon a bike path that began just across the street from my hotel. The high speed, multi-lane road was clogged at rush-hour, so I was glad to have a path – call it Serendipity! I set off to explore the Rogue River Gateway Trail, on a beautiful early fall afternoon, just before the leaves start to change color. This is the sort of weather I love riding in the most, appreciating the crisp fall breeze, and anticipating the upcoming change of seasons. There’s just enough sunshine to warm the path into the early evening, and I managed to squeeze in around 20 miles. Ride On! Being completely honest, however, the trail was not well maintained. The uncomfortably bumpy ride, with narrow bridge crossings, old grass clippings scattered on the trail, and very few water stations, made me truly appreciate how hard my home town of Columbus, OH works to keep trails clear of obstacles and overgrowth. I can’t judge the city of Dearborn on the basis of this one trail, but there were more cyclists on the busy road that ran for some distance alongside the trail than on the trail itself. It’s not one I would be likely to return to. Being accustomed to street riding back home, I’d have joined the other cyclists on the road, but wanted to give the trail a chance. 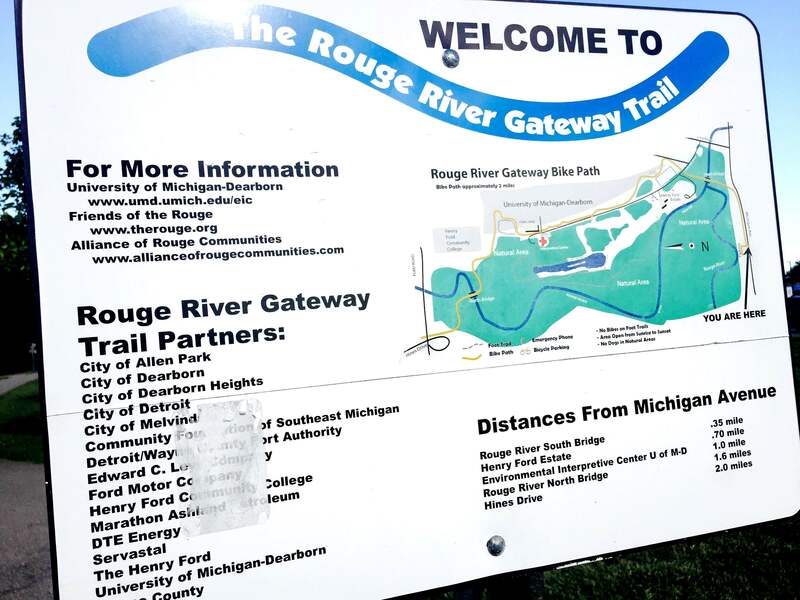 The most enjoyable, well maintained part of the trailI rode meandered through the campus of the University of Michigan – Dearborn. 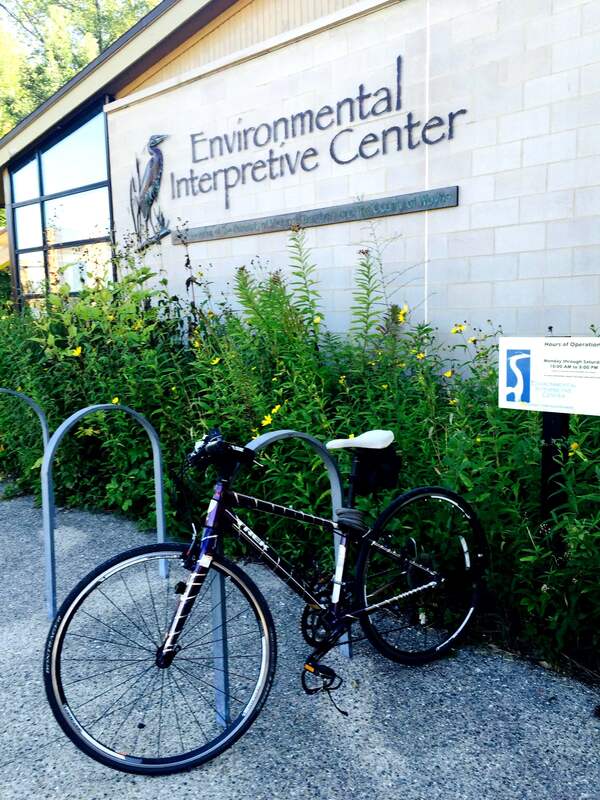 Along the trail I stumbled upon the university’s Environmental Interpretive Center. A community education center & research facility, the center is available to university students, school groups, and the public. It is part of a 300-acre Environmental Study Area. 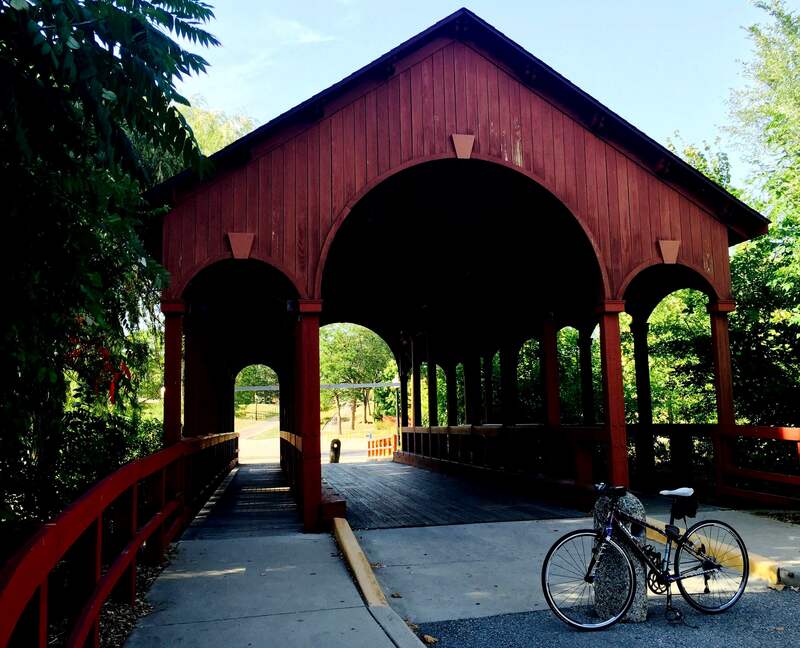 Running the bike path in front of the center will encourage the cycling population to visit. 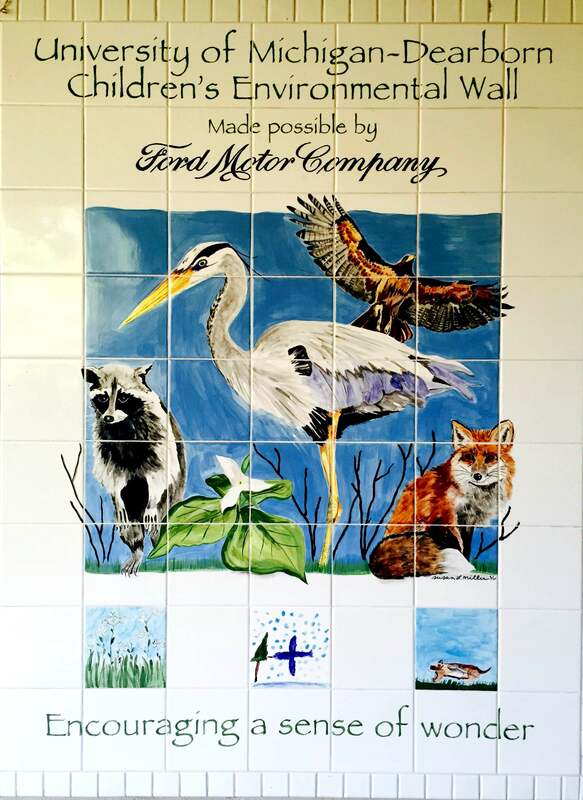 I did notice that the Ford Motor Company sponsored the tile wall covered with local children’s art outside. That’s one small way of giving back to the community, and environmental education. Next visit I’ll plan some extra time to participate in one of their programs, and I encourage anyone visiting the city of Dearborn or U of M – Dearborn to check it out! Following my ride, Big Fish Seafood Bistro seemed like the perfect spot for a patio dinner. The bar inside had upscale, sea life décor, and a friendly atmosphere. The restaurant is part of Muer Seafood Restaurants, and several are now on my list to try, including: Grand Concourse (Pittsburgh, PA), Gandy Dancer Saloon (Ann Arbor, MI), and River Crab & Blue Water Inn (St. Clair Township, MI). I’m a pescatarian (or just a conscientious eater), and would love to eat my way through this cluster of restaurants. With work in Pittsburgh, Ann Arbor, and much of the Midwest, I’ll make a point to do just that.